Welcome the majesty of the unicorn into your surroundings when you decorate with our unicorn home decor and gifts. 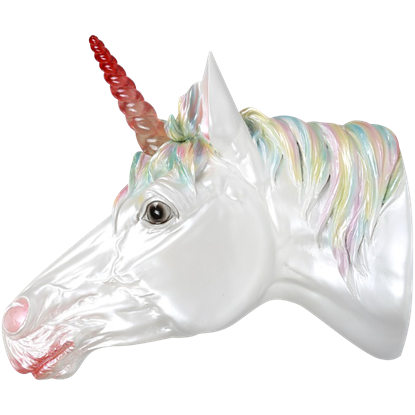 Here you will find a wide range of unicorn products perfect for adding beauty and sometimes extra usefulness to your surroundings. These fantasy decorations all feature unicorns in some way, but they vary in their purpose or design. 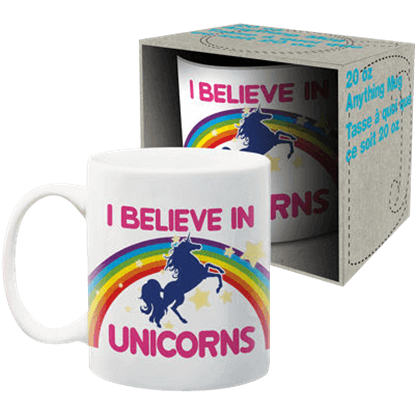 We offer unicorn drinkware, including collectible unicorn mugs, perfect for enjoying your favorite beverage while proclaiming your love for all things unicorn. Our unicorn wall signs, plaques, and clocks can bring beauty to any wall, and our unicorn pillows are perfect for resting on and dreaming of unicorns. Unicorn snow globes and unicorn journals make fantastic gifts for all sorts of unicorn fans. If you love unicorns, then you are sure to find something that will help you express that love here. 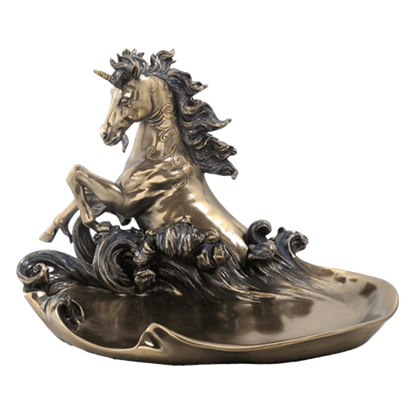 This Bronze Unicorn Dish depicts a rare scene taken straight out of fantasy. It features a subtle and magical style that makes it quite eye-catching, while its dish form makes it quite the useful fantasy decoration, too. 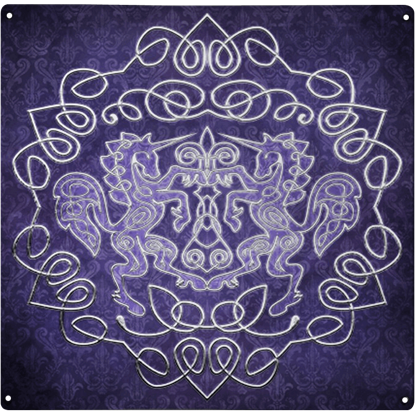 The combination of fantasy and Celtic knotwork is extremely fitting in the Celtic Unicorn Metal Sign since the unicorn is the national animal of Scotland. The two unicorns are even posed like the ones in the Scottish coat of arms! Take a walk with this mystic maiden, and who knows what magic may befall you! 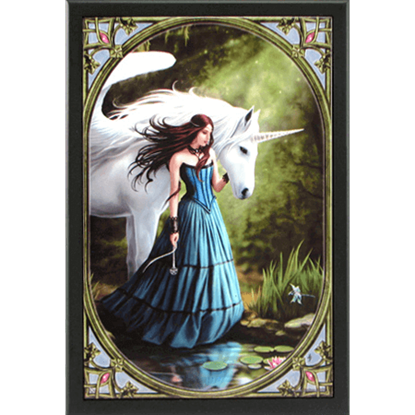 The Enchanted Pool Framed Art Tile features a scene from the art of Anne Stokes where a maiden in blue leads her winged unicorn friend to a mysterious pond. Step into the fairy glen, and see what enchantment awaits for your wonder. 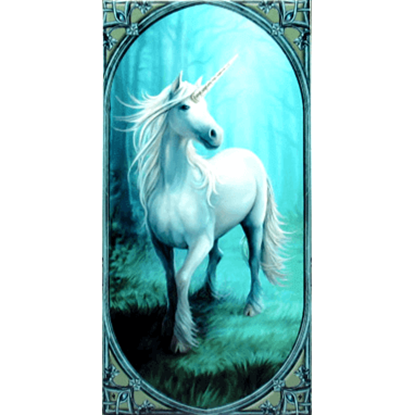 The Forest Unicorn Art Tile reveals a scene from the realms of fantasy, where a white unicorn stands ready to lead you through its glowing, twilight woods. If your little prince or princess wants to save up some money to buy their own unicorn, why not let them put some money into this Gold Unicorn Bank? Saving money is a good lesson for them to learn and this money bank is so cute. Sometimes a cup is the best daily reminder of how you feel about a subject, and with our I Believe in Unicorns Coffee Mug youll never be lost for an opinion on the matter. This ceramic mug features an iconic picture of a unicorn. One of the most beloved and mysterious creatures of fantasy appears in a carving on the side of this sculpted tree trunk statue. 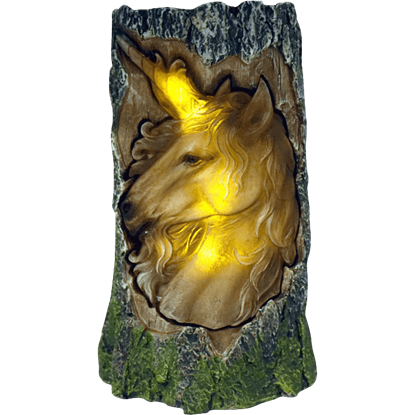 The LED Unicorn Log Light would fit in perfectly to a mystical wood or other magical setting. Bring beauty and magic into your home decor with the Light Up Unicorn Wall Plaque. When placed, this fantasy home accent looks like a unicorn head mounted to the wall. 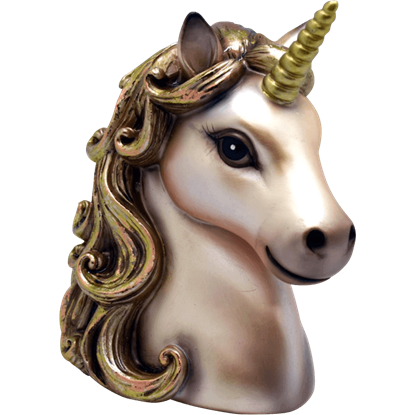 Made of ceramic, this unicorn decoration has a pearly finish. They say the purest of the beasts has hair so pale and radiant that even the moon seems dim in comparison. 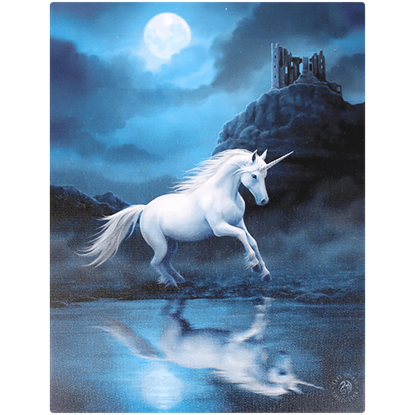 You can see for yourself whether this is true when you hang the Moonlight Unicorn Canvas Print by Anne Stokes on your wall. Carousels always excite children, and there is something about riding those glossy horses around and around that brings out the kid in adults. 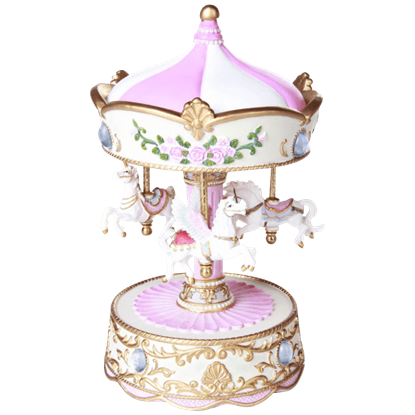 Now, you can put that fairground magic on your table with the Musical Fantasy Carousel. Rest your soul with the spirit of a unicorn, surrounded by the gentle green leaves of an eternal spring. 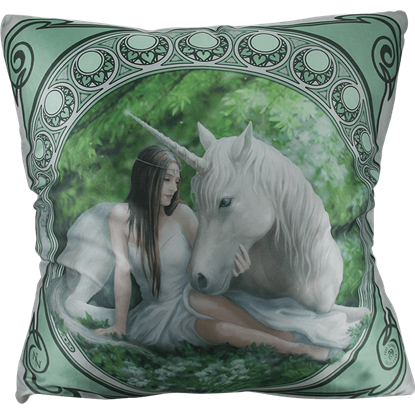 Bring the comfort of sweet fantasy to your surroundings with the Pure Heart Unicorn Pillow, featuring the art of Anne Stokes. The Unicorn symbolizes benevolence and courtly love. The horn is believed to have medicinal properties guaranteeing life and health. This banner features a Unicorn silk-screened in silver. 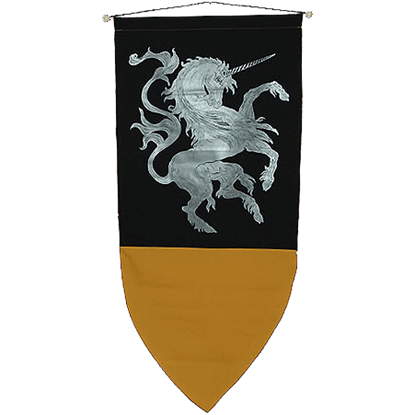 The Rampant Unicorn banner is made of cotton. Thank you so much. I've placed several orders (my entire costume) from this company and have had nothing but exceptional service as well as products.